Afghan policewomen handle AMD-65 rifles at a dusty firing range outside Kabul. They are trained by carabinieri, Italian military police from the local NATO troops. 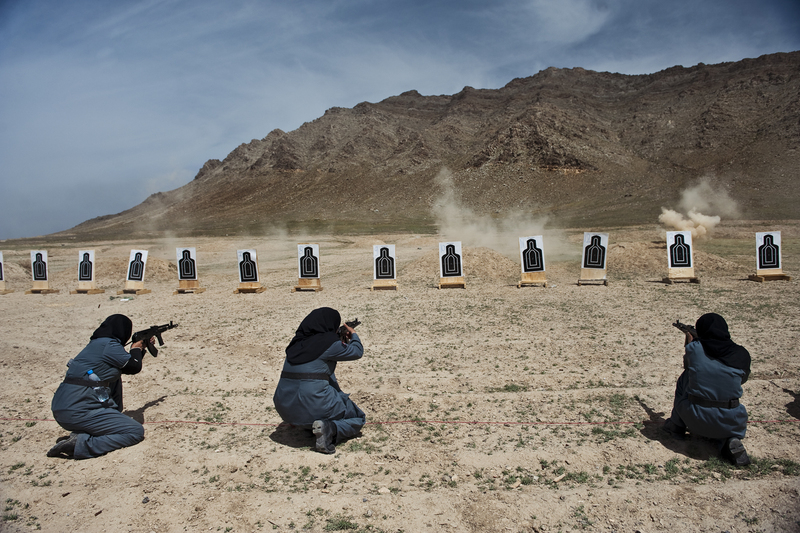 Joining the police force is a bold decision for an Afghan woman. Insurgents often attack the police. Very few women get permission to sign up from their husband and male relatives. Of 100,000 officers, only about 700 are female. Yet women are welcome recruits. They can take on tasks that men cannot because of Islamic custom: frisking other women, searching homes where female family members are present. Many who take the job are widows of fallen officers cast in the role of breadwinner. The pay is about $165 a month.